Oh what a weird and beautiful thing to travel to another city in my great state of Texas, only to find other TX based breweries beers on the shelves that are not sold anywhere near San Antonio. Thank you again Lone Star Beverages for having singles to purchase. I ended up buying a few bottles from Lakewood Brewing Company, but this was the first one I had out of them. 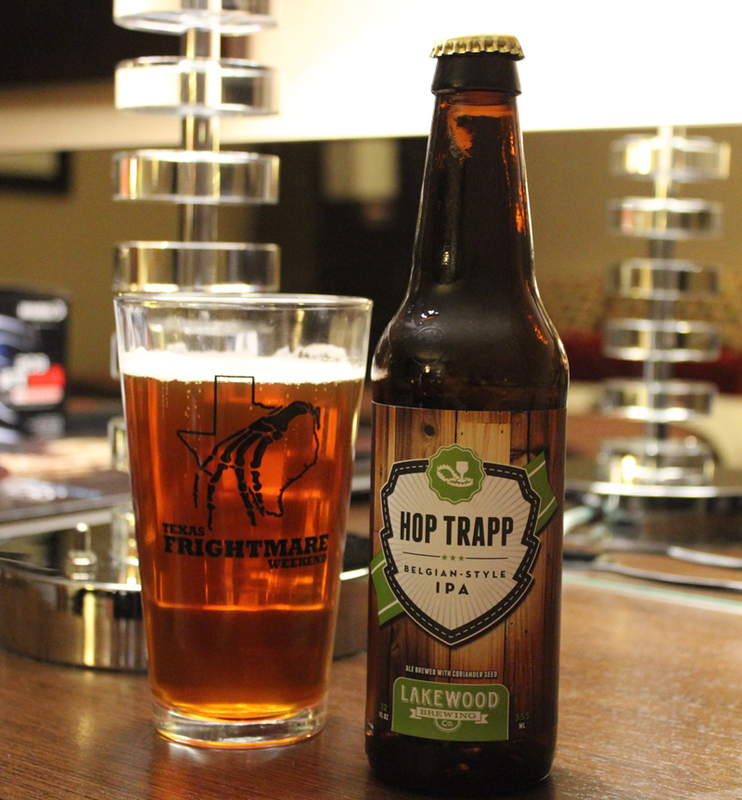 Texas Frightmare pint glass was used again here.It poured a very nice clear copper color with a thin bubbly white cap which had good retention, leaving a spotty, soapy lacing. It was a nice surprise to see how clear this beer is. There is a nice floral hop smell to this beer that takes over the nose, but it’s not very strong or overpowering. There are some malty smells as well as as some citrus notes. The ingredients all compliment each other in this beer. The hops, grains, and Belgian yeast are all present and accounted for! Taste is very similar to the aroma, as I can pick up the taste of herbal hops, bread-like characteristics, and some citrus as well. On the very end, there is a very faint banana flavor seeping through. I really love the combination of flavors hitting my palate in this beer. The body is of medium thickness, and has a crisp, yet smooth finish. Helping this beer go down quite easy! I can definitely say I am a fan of this beer, and I wish I would have bought more than one bottle. I’d love to have another one soon. Maybe I’ll have to plan a trip to Dallas again pretty soon. Five hours for some good beer, what do you think? Metal Connection: As I type this, I am thinking of a good song for the Metal Connection part of this review, and one band came to mind here. LORDI, yes I said Lordi! I, unlike most to all of my friends, really like Lordi. I like that they are playing old school 80’s sounding Rock with a horror twist. I really hate that everyone compares them to GWAR, as they are two completely different styles. So, sorry for those who do not agree with me, but I present you with the song “Blood Red Sandman” from their 2004 full length album, The Monsterican Dream. I also find this band, and song fitting as I am at the Texas Frightmare Weekend, and there are a lot of people in costume at this horror event. Enjoy!